" The more I looked, the more I found Christian Atheists everywhere. " 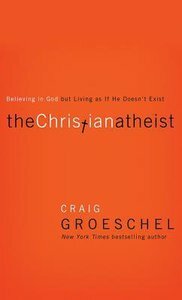 Former Christian Atheist Craig Groeschel knows his subject all too well. After over a decade of successful ministry, he had to make a painful self admission: although he believed in God, he was leading his church like God didn t exist. To Christians and non-Christians alike, to the churched and the unchurched, the journey leading up to Groeschel s admission and the journey that follows from his family and his upbringing to the lackluster and even diametrically opposed expressions of faith he encountered will look and sound like the story of their own lives. Now the founding and senior pastor of the multicampus, pace-setting LiveChurch.tv, Groeschel's personal journey toward a more authentic God-honoring life is more relevant than ever. Christians and Christian Atheists everywhere will be nodding their heads as they are challenged to take their own honest moment and ask the question: am I putting my whole faith in God but still living as if everything was up to me?" About "The Christian Atheist (Unabridged, 6 Cds)"